Jonathan Shaw hunts with hawks and falcons from horseback at his 467 acre farm in Queenstown on the eastern shore of Maryland. At the World Horse Expo 2019 at the Farm Complex in Harrisburg, he had two prey birds, his horse and two assistants. His avian hunter is Geronimo, a gyrfalcon, which will hunt ducks and pigeons. His Harris Hawk goes for rabbits, squirrels and, he adds tongue in cheek, “small children.” Historically, Shaw says, falconers would ride horses because they could catch up with the falcon which otherwise would eat the falconer's dinner! The tradition didn't die out until the invention of the gun, the first of which was named after a sparrow hawk, a "musket." Shaw goes on to tell about all the now common expressions that come from falconry like "hoodwink", "under my thumb" and "wrapped around her little finger." Shaw's ideal horse is a pasofino because of its even gait. It won't jostle the falcon up and down when it's sitting on the falconer's glove before release. Prior, he had hunted with American Paint horses but when he was trotting around the farm his "hawk would think I was shaking a cocktail." Watch video interview of falconer describing how he hunts ducks and rabbits with his hawks and falcons while riding horseback." A New Jersey van packed with fresh Atlantic seafood did a brisk business its first time out at the Chestnut Hill Farmers Market last Saturday. 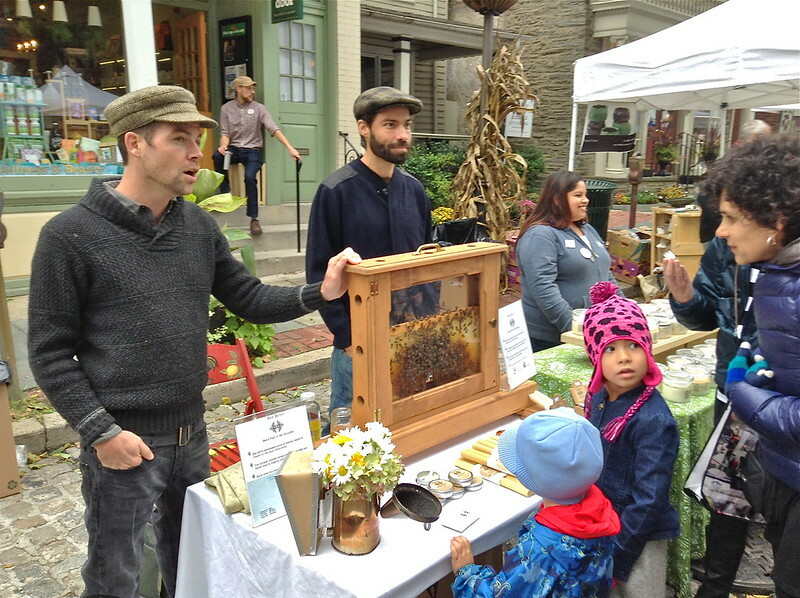 They plan to come every other week, alternating with the market they do in Bryn Mawr. Justin Hetrick introduced eager new customers and your correspondent to the fresh fish operation. "We are called Local130 Seafood [A large patriotic painting on the side of the van shouts it out] We are out of Asbury Park, New Jersey. The "130" stands for the amount of New Jersey coast line. All the fish that you see here today, with the exception of halibut which comes from New England, is coming right off the coast daily. Sea scallops out of Point Pleasant. You know Barnegat Light, Long Beach Island? We are Asbury Park, only 20 minutes from Point Pleasant and we can go the day they come in off the boat and get everything fresh that day. There’s a fleet of commercial boats that run out of there. Arguably, I think it’s the third largest port in New Jersey next to Barnegat Light and Cape May. They go out in all kinds of weather to catch us the fish that we need. We are pretty lucky and blessed to have that. Nothing here is ever frozen. Nothing that we sell in the shop is frozen. We pack it fresh and we put it on ice so it keeps the temperature nice and cold without ever actually freezing it. So it’s still soft to the touch. Here are some of the information cards that I didn’t put out yet - we have skate wings, the black sea bass, sea scallops, weakfish, fluke, A lot of people know it as flounder but we like to call it fluke. The only thing I don’t have a card for today is cod.” Watch video interview of fishmonger at Chestnut Hill farmers market in Philadelphia of fish caught fresh from Atlantic Ocean here. Shortly after noon on a frigid New Years Eve day a Thai food truck owner with help from his wife and parents prepares for a long day work day in old town Alexandria, Virginia. The town hosts a “First Night” celebration with entertainers performing at several venues. The food entrepreneur expected to be serving up traditional Thai dishes along with his signature Thai tacos, funnel cake and hot chocolate until the midnight fireworks, nearly 12 hours after your correspondent spoke with him. Watch video interview of Thai food truck entrepreneur who sells Thai Tacos. Hearing that WAWA convenience stores were giving out free coffee in celebration of International Coffee Day, on Friday morning your correspondent headed over to the Mt Airy store to grab a cup. The scene in the coffee area was crowded, festive- and a touch frenzied. The barista, who was refilling large coffee canisters non-stop, expected the store would serve about 4000 free cups that morning and said WAWA observes NATIONAL Coffee Day each year. He wasn't sure where WAWA coffee is sourced from but assured me all l needed to know was that it is the "best possible quality." It tasted just fine to me but, actually, I did want to know more so a little bit later that morning I visited the High Point Cafe in the Allen Lane train station Their barista wasn't acquainted with the unofficial holiday but quipped that every day is International Coffee day at High Point and comped me a delicious cup. He elaborated that High Point's "ethically sourced - locally roasted" coffee comes from small farms in Guatemala, Ethiopia, Sumatra and elsewhere. Watch customers crowd store for free coffee on National Coffee day and interviews. 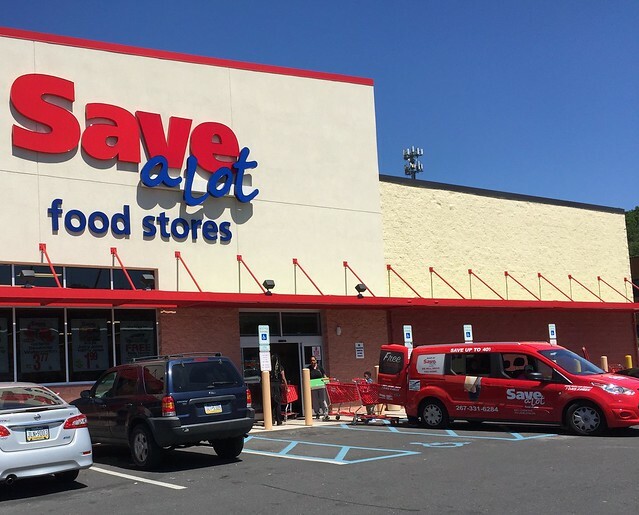 ​Save A Lot grocery stores will drive you home after you shop and, as one sly driver pointed out, will drive your groceries home, too. The driver says he's back at his store for another trip every ten minutes. A $60 minimum purchase is required to hop aboard and your destination should not be more than 2 and a half miles from the store. Your correspondent conducted this interview at the Chew Ave and Washington Lane store, formerly home to a Bottom Dollar food store, where cherries were on sale for $1.99 a pound and tasty they were but cannot vouch for whether they were ethically sourced. Watch video here. 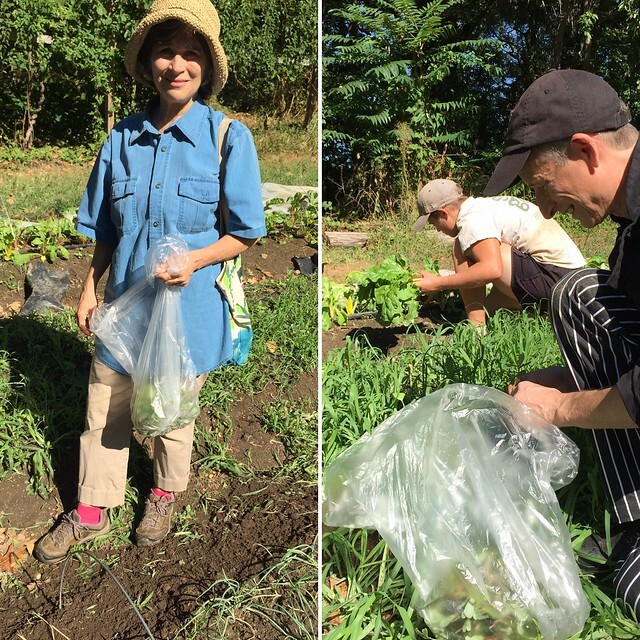 Lynn Landes, founder of the Wild Foodies of Philadelphia joins with Chef Jeff Miller of the eponymous catering company to forage for wild plants in the fields of the Weavers Way Coop farm at Awbury Arboretum. The plants, which Lynn doesn't like to call weeds although they are generally considered so, were to appear in the salad of a dinner that very evening to benefit the arboretum. Miller sampled some succulent-like purslane which he describes being crunchy and also some carpet weed which your correspond concurs has a strong, mushroomy flavor. These, wood sorrel other "weeds" were all competing for purchase in the fertile soil where the farmers had planted onions for harvest months later. Landes takes the zealot's stance that only wild plants and animals, free for the taking are a sustainable source of food because agriculture of any kind requires ongoing maintenance. Watch video here. 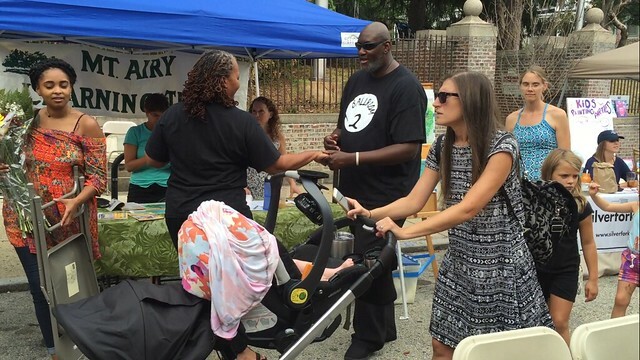 The annual Mount Airy Village Fair centered around the Greene and Carpenter Street intersection in the Mount Airy section of Northwest Philadelphia featured a variety of vendors and organizations and exhibitors. It was full of food, music, dance, crafts, family and children's activities, contests, pets for adoption, farm animals (watch recorded Periscope broadcast here) and more on a sunny Sunday, September 11, 2016. Here are a couple of video interviews conducted by your Fair going correspondent. June and Audrey Donaldson learned Detroit Style ballroom dancing at a dance conference in Cleveland in 2010 where they were teaching Philly bop. June relates that the style originated in a very large ballroom in Detroit called the Graystone. The dancers move smoothly and closely and incorporate the "step-in-1-2-3" of the cha-cha. The self-called "Bopologists" have been teaching Detroit style ballroom ever since and were dancing out on the street during the annual Mount Airy Village Fair in Philadelphia to promote their course through the Mount Airy Learning Tree. Watch video here. Through the Silver Fork Club's online presence, eaters too busy to cook can browse the offerings of local chefs and have a home-cooked meal delivered to them or arrange for a pick-up. 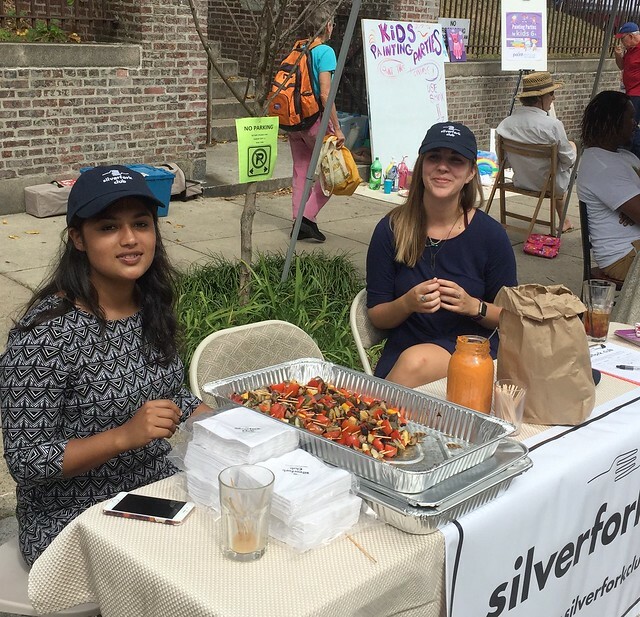 Young ambassadors at the Mount Airy Village affair offered free cooked veggie skewers to promote the service's imminent Philadelphia launch. Watch video here. Bee Boy Ryan Williamson is happy for any technology advancement that raises the profile of beekeeping but has reservations about the so called flow hive with preformed plastic combs. New beekeepers who think all they have to do is turn the handle and out will come honey risk harming the bees. He also believes that comb building is in the bees' genetic coding and something that they are meant to do and is good for them. The Bee Boys are organic beekeepers whose simple mission, according to their website is to support the honeybees! At the right in photo is Bee Boy Kevin O'Connor. Watch Video here. Helen Ambrose watches construction progress of The Fresh Market store and condominium complex in Chestnut Hill with mixed feelings. A few years ago Ambrose and her neighbors were commiserating about how dead the Germantown Avenue corridor seemed. She is worried now about the increased traffic the development will bring but still welcomes it. She patronized The Fresh Market store when she lived in North Carolina. “They have amazing meats, seafood and specialty foods,” she says and welcomes more shopping options. She also shops at Trader Joes and Weavers Way Coop and really likes the Chestnut Hill Farmer’s Market (now “Market at the Fareway”) which she hopes can “hang in there.” Watch video interview here.